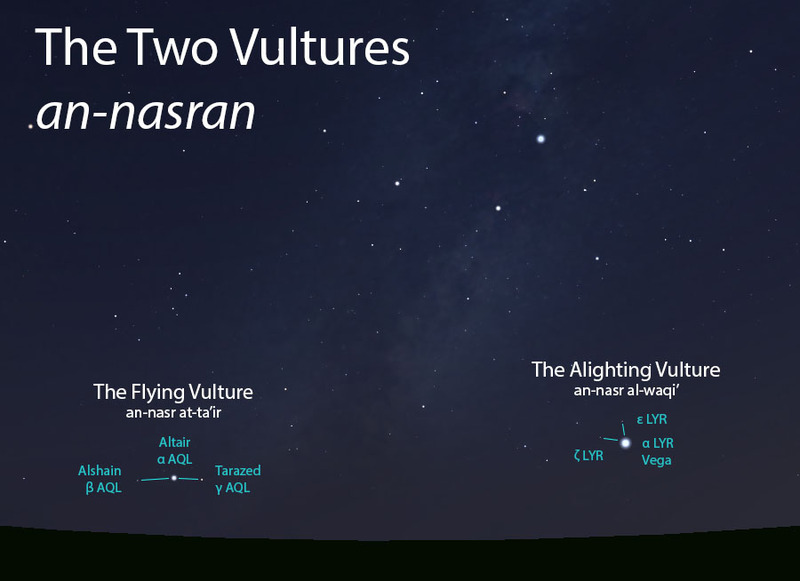 The Two Vultures include the Alighting Vulture (an-nasr al-waqi’) and the Flying Vulture (an-nasr at-ta’ir). In modern-day Arabic, the term nasr more commonly indicates an eagle, but this was less common long ago. Back then, nasr designated a class of large birds known for plucking flesh with the curved ends of their otherwise flat beaks. The Egyptians revered the vulture for its utility in eliminating decaying animals, and the Arabs similarly regarded them favorably. 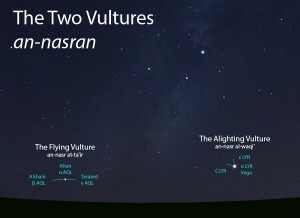 The Flying Vulture was so named because the two moderately-bright stars lie in-line with the central brilliant star, like the wings of a vulture that is soaring. The Two Vultures (an-nasran) as they appear setting in the west about 45 minutes before sunrise in mid-August. Sky simulations made with Stellarium. A pair of very bright stars that are spaced widely apart, each one with two less bright stars close to it. In the calendars of Qushayr and Qays, the morning settings of the Two Vultures marked the beginning of the rainy season of fruit harvest (al-kharif). The Two Vultures are not one of the lunar stations.